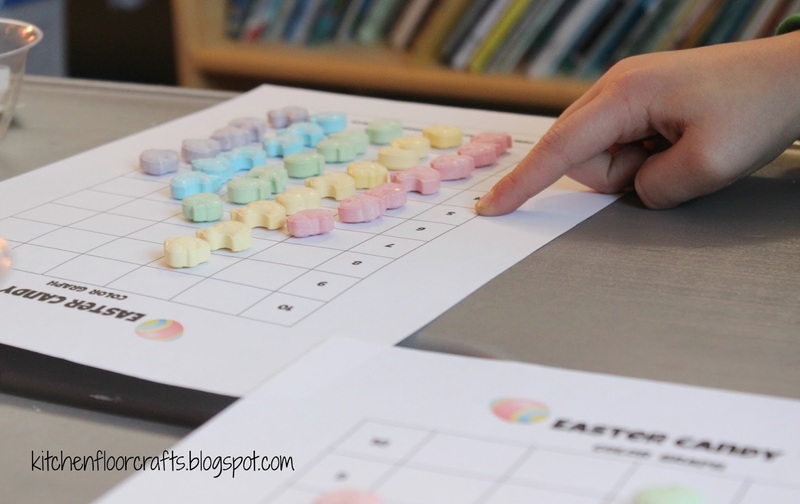 One of our favorite things to do with seasonal candy is use it as a math manipulative. 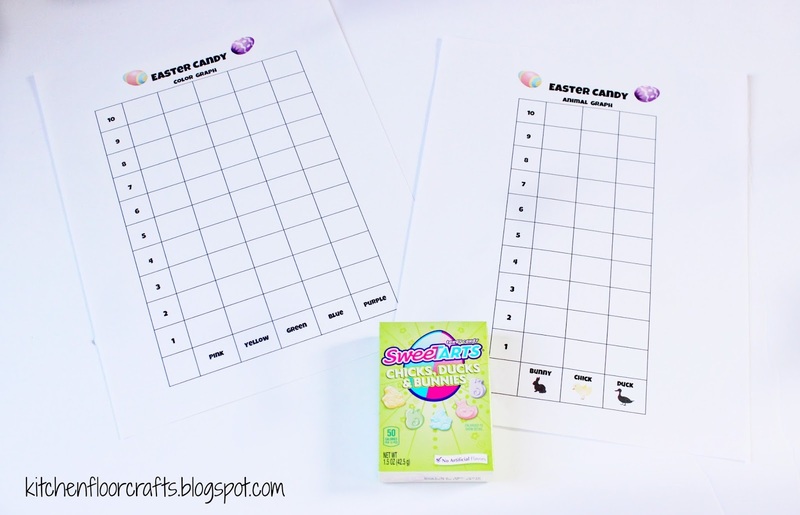 In the past we've used candy hearts for math games, counted with pumpkins, and done math play with jelly beans. 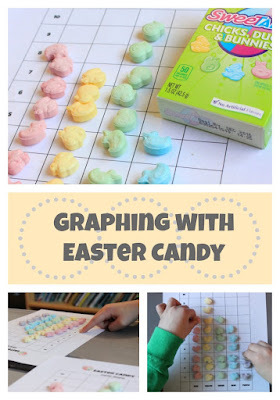 So when I saw these SweetTart Easter Candies at the grocery store I knew they would be perfect for math play. 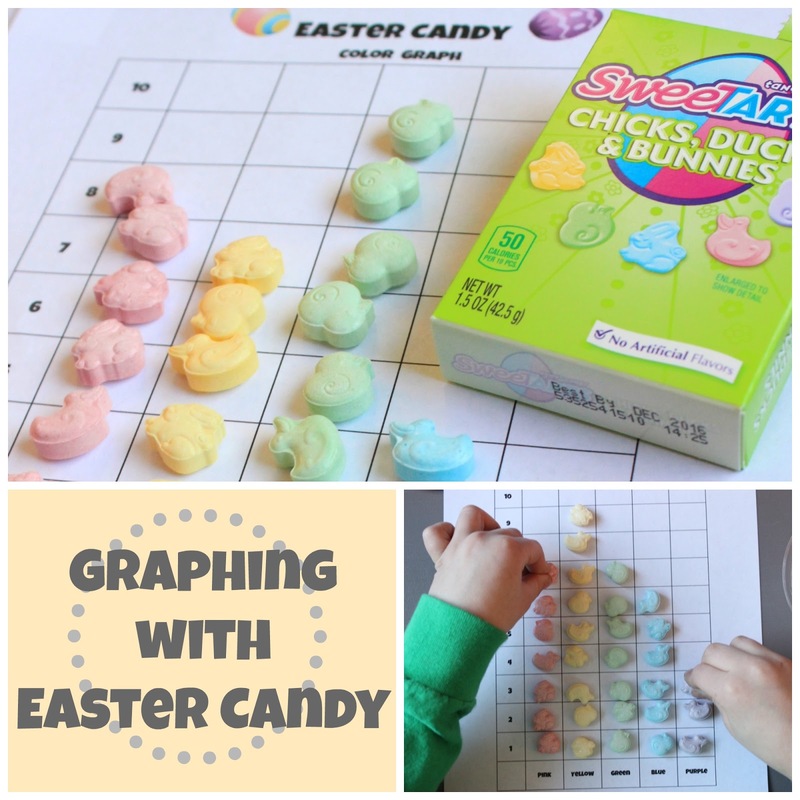 Since the candies were both colorful and different shapes, we decided to graph them! I made up two graphs: a color graph and an animal graph. We want you to be able to play too, so at the end of the post you'll find the link for the graphs! 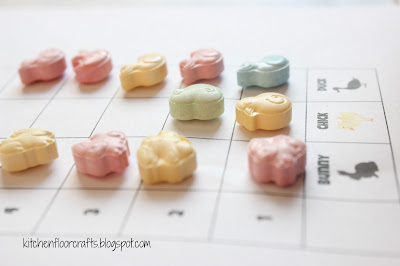 We bought small boxes of the candies so each kiddo could have their own collection of candies, but these candies also come in a large bag and this play could be done with whole class as a fun, special activity. To prepare I printed one copy of each graph for each of the boys and I also gave them each a small bowl for dumping their candies into. We started with the color graph. 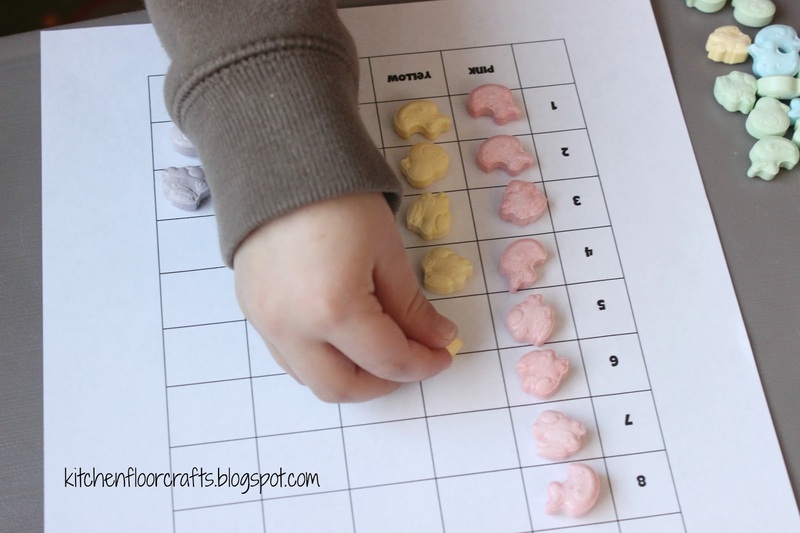 Big Brother has graphed with candy before and can read all his color words, so he got started with the candies right away. Little Brother needed a little more help with the project. To get him started I put one candy of each color in the bottom and then showed him how to put one candy in each square working upwards. This was great fine motor and sorting practice for him, and he quickly got the hand of it. 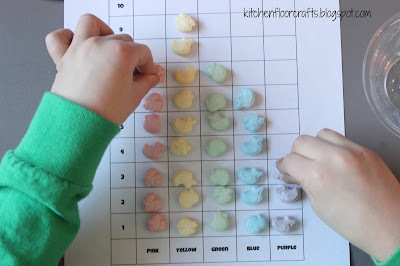 We also had our 4 year old friend visiting, and he too pretty quickly got the hand of graphing and got excited about trying to see which color would have "the most." 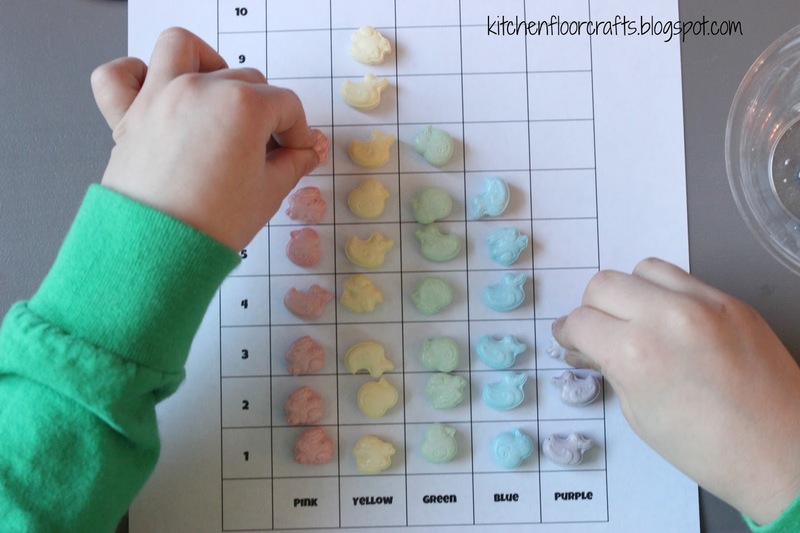 After we graphed the colors, we graphed the candies by animals. Once the graph is complete you can ask some great math questions. With younger kids we usually look for which one has "the most" and which one has "the least." You can also have kiddos count each one. With older kids you can ask them to compare with questions like, "How many more pink candies do you have than blue candies?" Or, "How many fewer green candies do you have than yellow candies?" Of course, we always sample a few candies too once the graphing is done. Such yummy treats! Don't forget to print your own free graphs. Check out the link here! 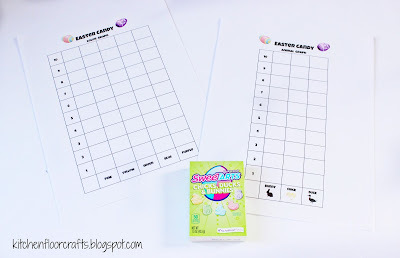 What a fun activity to do with kids! Love the graphs and the Easter candy!